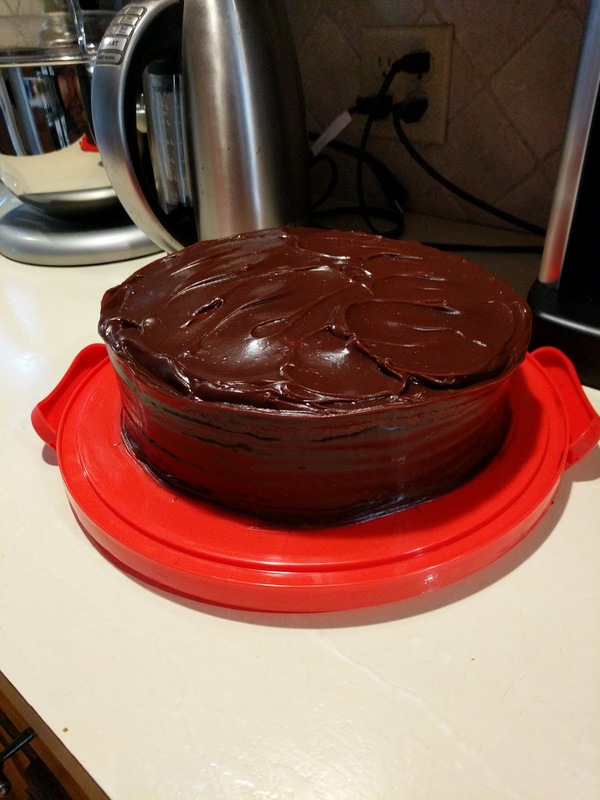 Yesterday I made a cake for a bake-off at my husband's workplace. It's a fundraiser, with proceeds going to fight malaria. I'm used it as an opportunity to test out a recipe combination I wanted to try. 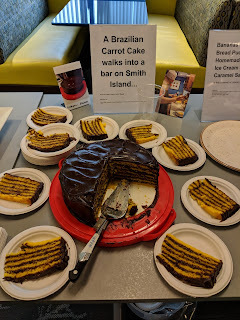 After my success making a Smith Island cake, I thought it would be fun to make a Brazilian carrot cake version to enter in next year's fair. This is my first chance to try out my concept. Blend the carrots, oil and eggs in a blender and then mix in a bowl with the rest of the ingredients. Weighing this out (the cake layers each need 200g) yielded only 6 layers. For future reference, make 1.5 batches to get 8-9 layers of cake. Other things to note: bake at 350 for 13 minutes per 2 layers. I had a few technical difficulties here, with my oven mitt gouging one of the layers (I'm using it anyway, I plan to fill up the hole with chocolate) and another layer getting stuck on one side because I didn't have enough baking spray. Heat the cream, sugar and vanilla and pour over the chocolate. Whisk until melted and smooth. Add the butter and whisk until smooth. Chill for about an hour and then use to frost the cake. It's not often we do our Thanksgiving dinner on the actual day. Usually I have to work and we have our celebration on a different day. Not this year! Roast goose. I followed Hank Shaw's instructions from Duck, Duck, Goose, removing the breasts halfway through the cooking and then searing them at the end. This was more work than I anticipated and I think it came out too tough. Not the recipe's fault, maybe mine? Anyway, for the price of a fresh farm raised goose I think it will be easier to stick with a smaller turkey. The gravy that is made from the giblets is pretty tasty, though. Stuffing, topped with goose fat before reheating. Cranberry sauce which I made the other day. Mashed potatoes, made by my husband. Sweet potatoes and marshmallows, made by my mom. She also made a Brussels sprouts and grape dish that was pretty good, so says those of us who like Brussels sprouts. Pumpkin bread, made by my sister-in-law, and brioche dinner rolls, made by me. I made the dough last night and refrigerated it until this morning when I got up early and shaped a dozen dinner rolls. I haven't made brioche in ages! Lastly, the pies. I had a pumpkin pie and that fabulous apple pie I made yesterday. The cornstarch worked perfectly, the crust was flaky and light, and not having a solid top crust wasn't a problem at all. I topped the pie with homemade caramel sauce which I made this morning and then there was ice cream and whipped cream because what's a pie without one or the other? So from me to all of you, Happy Thanksgiving and may your table always overflow with lovely homemade food! 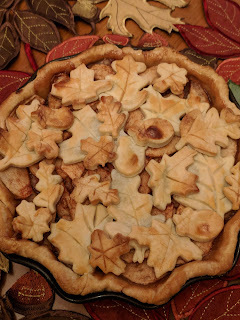 I've been trying for a while now to get a particular look for my apple pies. I want them to look autumny. Like piles of fallen leaves. I want them to evoke that nip in the air that screams snow is coming and still look tasty enough to eat. It's Thanksgiving, and I want my pie to be perfect. 1. I used my smaller (new) pie plate so only 6 apples. 2. Therefore, I dropped the sugar to 3/4 cup. 3. I added 2 T. of cornstarch to the sugar because I'm tired of my pies being runny. 4. No top crust - I covered the apples with cut outs of leaves and acorns, all scored with a knife, and tossed randomly but strategically onto the pie. 5. I used an egg-milk wash rather than milk and sugar. 6. The pie was baked uncovered first, and then covered for the second half of the baking process. Not very scientific of me, but I can probably trace each alteration to a specific result and therefore I should be able to figure out which of these I should do again.